Figuring out which of the different potty training methods is most suitable, is probably the hardest part when starting to potty train a special needs child. You may have to try a few before you know which one will work best for you and your child. Once you have figured it out, have a plan of action and gather all the right potty training equipment...just get going and stick to it. Here we will have a look at the different methods that have been used successfully by moms of special needs children, in the past. We will also have a look at the pro's and con's of each toilet training method. This method is used mainly in third world countries, and the least used method in South Africa. It involves holding an infant over a potty and catching the eliminations. As a mom, you have to learn the infants rhythms and the infant has to learn to recognise the sensations that occur before he needs to go. This method only works effectively when the use of disposable nappies is minimal or non existent. The infant will eventually learn how signal when they need to go. Potty training starts early and finishes early. Wetting and soiling themselves is not likely to become a habit for the child. Less use of a nappy is more hygienic, cost effective and healthier for your infant. Very time consuming, and not an ideal training method for working mom's. 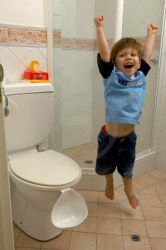 You have to be dedicated, stay on top of it and stick it out until your child can use the potty by themselves. There may be many accidents and many clean ups. Practice until you get it right potty training method - It's potty time! Slowly introduce the potty to your child. Gradually teach them to use it, with no pressure. Constant praise your child for his efforts and reward him when he gets it right. Keep a chart or a log book of his progress. Make a gradual transition from nappies to potty to underwear. This method can easily fit into a busy schedule. You have to stick to the structure and schedule until your child is fully potty trained. Can take anywhere from a weekend to few months depending on the readiness, developmental and maturity level's of your child. May not learn to ask to go to the potty, as you always initiate. Keeping your child interested to sit on the potty long enough to actually use it. The best way to learn something is to teach it to them yourself. Use a potty training doll, to show your child the correct potty training behaviour. Let your child copy your actions with them, but on the doll. All actions have consequences, either positive or negative. Very quick, can be done in one day, and no more than two weeks. It is a very structured method. You have to follow through, all the time. Made to look a whole lot easier than it is. The basic idea of this method is that potty training is a developmental milestone, such as walking, talking, eating etc.It is your job as a parent to introduce the potty and all the related tasks to your child. As your child is ready, he will then in effect, train himself. This method is easy to fit into a busy life style. Very little preparation is needed by the parent. Does not require a large time commitment or consistency for parents, so is ideal for working parents. Can take 6 months or more to too fully train the child. Your child may be quite a bit older before he is ready to potty train. Wetting and soiling can become a difficult habit to break with your child. This method is a great concept, but may not work so well in reality - especially in a society that is so dependant on disposable nappies. Your child must be between 24 and 30 months of age, for this method to work effectively. You need spend between 3 and 5 days, consecutively using this method. Your child must be allowed to be naked all day, with a potty readily available. Allot of experts do not agree with this method. Quick, 3 - 5 days. This is not a method supported by experts.